When Sarah from Nuix got in touch with us, she was searching for surprise birthday party entertainment for the CEO of the business. He was visiting from Australia and the company had chosen the beautiful and historically fascinating Sir John Soane’s Museum in Lincoln’s Inn Fields, right in the heart of London. Their biggest clue was that they knew he liked opera! They were looking for appropriate background music for the champagne reception and parts of the dinner – and a ‘main act’ between the main course and desert. Priding ourselves on a bespoke and tailored service, we suggested a few possibilities. The company decided to book a string trio for the background act and an opera singer with a pianist for the performance part of the surprise dinner. The opera singer and pianist were carefully sourced from the Classical Choir that we’ve worked with very successfully over the last few years. These acts work well in a smaller venue like the Museum where it’s always going to be more of an intimate event and never contain hundreds of guests. 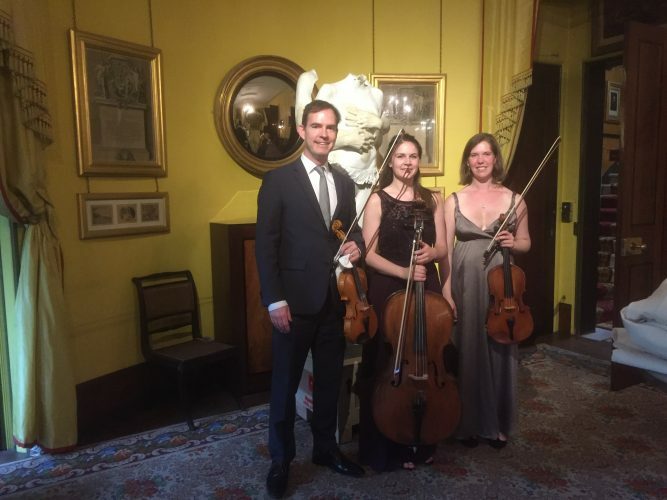 The simple elegance of a string trio and a mezzo-soprano with piano accompaniment seemed perfect for the beauty of the surroundings, whilst also not taking up too much room or being too loud. On the evening, the string trio played classical music as the guests arrived and were sipping champagne and being offered canapés. 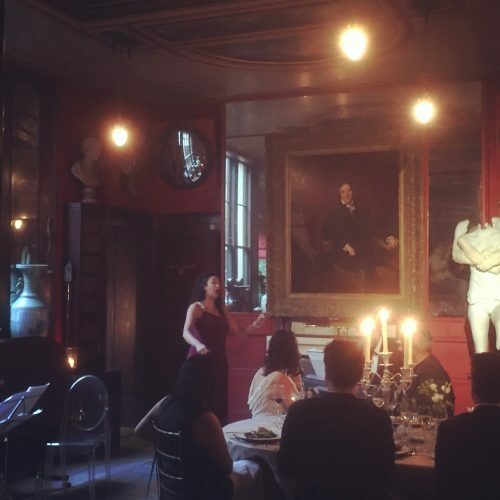 They played Baroque, classical and some romantic music for this and the first part of the dinner which started after a guided tour of the Museum. The tempo was lifted slightly as the starters arrived and we received a kind round of applause after playing Mozart’s ‘Eine Kleine Nachtmusik’. Then the trio took a break as Felicity and Liam got ready to perform some opera. This was a complete surprise to most. Felicity sang Puccini, Mozart, Bizet and other opera favorites. Her voice is powerful and filled the Museum. Needless to say, it was extremely well-received by our client and all the guests and looked and sounded superb in the candle-lit room. Following this, the string trio decided to play more light music – a selection from the musicals, some light jazz and more contemporary pop songs like ‘Latch’, ‘Stay With Me’ and others that work well for this combination of instruments. We try to tailor music to the atmosphere of the event and think it’s always good to ‘read’ the mood (like DJs do). People were relaxed and had just enjoyed excellent food and wine. So we thought lighter and more gentle music would be more appropriate towards the end of the dinner. It was a lovely event in a unique and special venue, so we were delighted to be a part of it. Contact us if you’re having a special and bespoke event. We’re always very happy to offer some musical suggestions that will compliment the occasion and help make it a truly memorable event.